This article is about the 1981 arcade game. For the 1994 Game Boy game, see Donkey Kong (Game Boy). For the title character, see Donkey Kong (character). For the sequels, see Donkey Kong Jr. and Donkey Kong 3. Donkey Kong[b] is an arcade game released by Nintendo in 1981. An early example of the platform game genre, the gameplay focuses on maneuvering the main character across a series of platforms while dodging and jumping over obstacles. 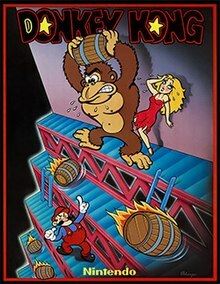 In the game, Mario (originally named Mr. Video and then Jumpman) must rescue a damsel in distress named Pauline (originally named Lady), from a giant ape named Donkey Kong. The hero and ape later became two of Nintendo's most popular and recognizable characters. Donkey Kong is one of the most important games from the golden age of arcade video games as well as one of the most popular arcade games of all time. The game was the latest in a series of efforts by Nintendo to break into the North American market. Hiroshi Yamauchi, Nintendo's president at the time, assigned the project to a first-time video game designer named Shigeru Miyamoto. Drawing from a wide range of inspirations, including Popeye, Beauty and the Beast, and King Kong, Miyamoto developed the scenario and designed the game alongside Nintendo's chief engineer, Gunpei Yokoi. The two men broke new ground by using graphics as a means of characterization, including cutscenes to advance the game's plot, and integrating multiple stages into the gameplay. Although Nintendo's American staff was initially apprehensive, Donkey Kong succeeded commercially and critically in North America and Japan. Nintendo licensed the game to Coleco, who developed home console versions for numerous platforms. Other companies cloned Nintendo's hit and avoided royalties altogether. Miyamoto's characters appeared on cereal boxes, television cartoons, and dozens of other places. A lawsuit brought on by Universal City Studios (which later would drop "City"), alleging Donkey Kong violated their trademark of King Kong, ultimately failed. The success of Donkey Kong and Nintendo's victory in the courtroom helped to position the company for video game market dominance from its release in 1981 until the late 1990s (1996–1999). 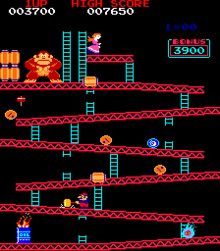 Gameplay of Donkey Kong in the first stage, with Mario holding a hammer. Competitive video gamers and referees stress the game's high level of difficulty compared to other classic arcade games. Winning the game requires patience and the ability to accurately time Mario's ascent. :82 In addition to presenting the goal of saving Pauline, the game also gives the player a score. Points are awarded for the following: leaping over obstacles; destroying objects with a hammer power-up; collecting items such as hats, parasols, and purses (presumably belonging to Pauline); removing rivets from platforms; and completing each stage (determined by a steadily decreasing bonus counter). The player typically receives three lives with a bonus awarded for 7,000 points, although this can be modified via the game's built in DIP switches. One life is lost whenever Mario touches Donkey Kong or any enemy object, falls too far through a gap or off the end of a platform, or lets the bonus counter reach zero. The game is divided into four different single-screen stages. Each represents 25 meters of the structure Donkey Kong has climbed, one stage being 25 meters higher than the previous. The final stage occurs at 100 meters. Stage one involves Mario scaling a construction site made of crooked girders and ladders while jumping over or hammering barrels and oil drums tossed by Donkey Kong. Stage two involves climbing a five-story structure of conveyor belts, each of which transport cement pans. The third stage involves the player riding elevators while avoiding bouncing springs. The fourth and final stage requires Mario to remove eight rivets from the platforms supporting Donkey Kong; removing the final rivet causes Donkey Kong to fall and the hero to be reunited with Pauline. These four stages combine to form a level. Upon completion of the fourth stage, the level then increments, and the game repeats the stages with progressive difficulty. For example, Donkey Kong begins to hurl barrels faster and sometimes diagonally, and fireballs speed up. The victory music alternates between levels 1 and 2. The fourth level, however, consists of 5 stages with the final stage at 125 meters. The 22nd level is colloquially known as the kill screen, due to an error in the game's programming that kills Mario after a few seconds, effectively ending the game. On the final screen of each level, Mario and Pauline are reunited. Donkey Kong is the first example of a complete narrative told in video game form, and like 1980's Pac-Man, it employs cutscenes to advance its plot. The game opens with the gorilla climbing a pair of ladders to the top of a construction site. He sets Pauline down and stomps his feet, causing the steel beams to change shape. He then moves to his final perch and sneers. A melody then plays, and the level (or stage) starts. This brief animation sets the scene and adds background to the gameplay, a first for video games. Upon reaching the end of the stage, another cutscene begins. A heart appears between Mario and Pauline, but Donkey Kong grabs the woman and climbs higher, causing the heart to break. The narrative concludes when Mario reaches the end of the rivet stage. He and Pauline are reunited, and a short intermission plays. :40–42 The gameplay then loops from the beginning at a higher level of difficulty, without any formal ending. As of late 1980 to early 1981, Nintendo's efforts to expand to North America had failed, culminating with the attempted export of the otherwise successful Radar Scope. They were left with a large number of unsold Radar Scope machines, so company president Hiroshi Yamauchi thought of simply converting them into something new. He approached a young industrial designer named Shigeru Miyamoto, who had been working for Nintendo since 1977, to see if he could design such a replacement. Miyamoto said that he could. :157 Yamauchi appointed Nintendo's head engineer, Gunpei Yokoi, to supervise the project. :158 Nintendo's budget for the development of the game was $100,000. Some sources also claim that Ikegami Tsushinki was involved in some of the development. They played no role in the game's creation or concept, but were hired to provide "mechanical programming assistance to fix the software created by Nintendo". At the time, Nintendo was also pursuing a license to make a game based on the Popeye comic strip. When this license attempt failed, Nintendo took the opportunity to create new characters that could then be marketed and used in later games. :238 Miyamoto came up with many characters and plot concepts, but he eventually settled on a love triangle between a gorilla, a carpenter, and a girlfriend that mirrors the rivalry between Bluto and Popeye for Olive Oyl. :39 Bluto became an ape, which Miyamoto said was "nothing too evil or repulsive". :47 He would be the pet of the main character, "a funny, hang-loose kind of guy. ":47 Miyamoto has also named "Beauty and the Beast" and the 1933 film King Kong as influences. :36 Although its origin as a comic strip license played a major part, Donkey Kong marked the first time that the storyline for a video game preceded the game's programming rather than simply being appended as an afterthought. :38 Unrelated Popeye games would eventually be released by Nintendo for the Game & Watch the following month, and for the arcades in 1982. Yamauchi wanted primarily to target the North American market, so he mandated that the game be given an English title, though many of their games to this point had English titles anyway. Miyamoto decided to name the game for the ape, whom he felt was the strongest character. :39 The story of how Miyamoto came up with the name "Donkey Kong" varies. A false urban myth says that the name was originally meant to be "Monkey Kong", but was misspelled or misinterpreted due to a blurred fax or bad telephone connection. Another, more credible story claims Miyamoto looked in a Japanese-English dictionary for something that would mean "stubborn gorilla", or that "Donkey" was meant to convey "silly" or "stubborn"; "Kong" was common Japanese slang for "gorilla". :238 A rival claim is that he worked with Nintendo's export manager to come up with the title, and that "Donkey" was meant to represent "stupid and goofy". :48–49 In the end, Miyamoto stated that he thought the name would convey the thought of a "stupid ape". Miyamoto himself had high hopes for his new project. He lacked the technical skills to program it alone, so instead came up with concepts and consulted technicians to see if they were possible. He wanted to make the characters different sizes, move in different manners and react in various ways. Yokoi thought Miyamoto's original design was too complex,:47–48 though he had some difficult suggestions himself, such as using see-saws to catapult the hero across the screen (eventually found too hard to program, though a similar concept would appear in the aforementioned Popeye arcade game). Miyamoto then thought of using sloped platforms, barrels and ladders. When he specified that the game would have multiple stages, the four-man programming team complained that he was essentially asking them to make the game repeatedly. :38–39 Nevertheless, they followed Miyamoto's design, creating a total of approximately 20 kilobytes of content. :530 Yukio Kaneoka composed a simple soundtrack to serve as background music for the levels and story events. The circuit board of Radar Scope was restructured for Donkey Kong. The Radar Scope hardware, originally inspired by the Namco Galaxian hardware, was designed for a large number of enemies moving around at high speeds, which Donkey Kong did not require, so the development team removed unnecessary functions and reduced the scale of the circuit board. While the gameplay and graphics were reworked for updated ROM chips, the existing CPU, sound hardware and monitor were left intact. The character set, scoreboard, upper HUD display and font are almost identical to Radar Scope, with palette differences. The Donkey Kong hardware had the memory capacity for displaying 128 foreground sprites at 16x16 pixels each and 256 background tiles at 8x8 pixels each. Mario and all moving objects used single sprites, the taller Pauline used two sprites, and the larger Donkey Kong used six sprites. Stone and Judy convinced the managers of two bars in Seattle, Washington, to set up Donkey Kong machines. The managers initially showed reluctance, but when they saw sales of $30 a day—or 120 plays—for a week straight, they requested more units. :68 In their Redmond headquarters, a skeleton crew composed of Arakawa, his wife Yoko, James, Judy, Phillips and Stone set about gutting 2,000 surplus Radar Scope machines and converting them with Donkey Kong motherboards and power supplies from Japan. :110 The game officially went on sale in July 1981.:211 Actor Harris Shore created the first live-action Mario in the television commercials for Colecovision's hand-held Donkey Kong and Donkey Kong, Junior video games. In 1983, Atari released several computer versions under the Atarisoft label. All of the computer ports had the cement factory level, while most of the console versions did not. None of the home versions of Donkey Kong had all of the intermissions or animations from the arcade game. Some have Donkey Kong on the left side of the screen in the barrel level (like he is in the arcade game) and others have him on the right side. Miyamoto created a greatly simplified version for the Game & Watch multiscreen. Other ports include the Apple II, Atari 7800, Intellivision, Commodore VIC-20, Famicom Disk System, IBM PC booter, ZX Spectrum, Amstrad CPC, MSX, Atari 8-bit family and Mini-Arcade versions. Two separate and distinct ports were developed for the Commodore 64 - the first was published by Atarisoft in 1983, and the second by Ocean Software in 1986. The game was ported to Nintendo's Family Computer (Famicom) console and released in Japan on July 15, 1983 as one of the system's three launch games. It was also an early game for the Famicom's western version, the Nintendo Entertainment System (NES), as it was launched on June 1 in North America and October 15, 1986 in Europe. The game was ported by the Famicom and NES developer, Nintendo Research & Development 2, under the Arcade Classics Series of NES games. The cement factory level was not included, however, nor did most of the cutscenes since initial ROM cartridges didn't have enough memory available. Nevertheless, the port includes a new song composed by Yukio Kaneoka for the title screen. Both Donkey Kong and its sequel, Donkey Kong Jr., are included in the 1988 NES compilation Donkey Kong Classics. A complete remake of the original arcade game on the Game Boy, titled Donkey Kong (referred to as Donkey Kong '94 during development) contains levels from both the original Donkey Kong and Donkey Kong Jr. arcades. It starts with the same damsel-in-distress premise and four basic locations as the arcade game and then progresses to 97 additional puzzle-based levels. It is the first game to have built-in enhancement for the Super Game Boy accessory. The arcade version makes an appearance in Donkey Kong 64 in the Frantic Factory level. In 2004, Namco released an arcade cabinet which contained Donkey Kong, Donkey Kong Jr. and Mario Bros. The NES version was re-released as an unlockable game in Animal Crossing for the GameCube. It was also sold as a Virtual Console game for the Wii, Wii U and Nintendo 3DS. The Wii U version is also the last game that was released to celebrate the 30-year anniversary of the Japanese version of the NES, the Famicom. The original arcade version of the game appears in the Nintendo 64 game Donkey Kong 64. Nintendo released the NES version on the e-Reader and for the Game Boy Advance Classic NES series in 2002 and 2004, respectively. Donkey Kong: Original Edition is a port based on the NES version that reinstates the cement factory stage and includes some intermission animations absent from the original NES version, which has only ever been released on the Virtual Console. It was preinstalled on 25th Anniversary PAL region red Wii systems, which were first released in Europe on October 29, 2010. In Japan, a download code for the game for Nintendo 3DS Virtual Console was sent to users who purchased New Super Mario Bros. 2 or Brain Age: Concentration Training from the Nintendo eShop from July 28 to September 2, 2012. In North America, a download code for the game for Nintendo 3DS Virtual Console was sent to users who purchased one of five select 3DS games on the Nintendo eShop and registered it on Club Nintendo from October 1, 2012 to January 6, 2013. In Europe and Australia, it was released for purchase on the Nintendo 3DS eShop, being released on September 18, 2014 in Europe and on September 19, 2014 in Australia. The original arcade version was re-released as part of the Arcade Archives series for Nintendo Switch on June 14, 2018, and the NES version was re-released as one of the launch titles for Nintendo Switch Online on September 13, 2018. In his 1982 book Video Invaders, Steve Bloom described Donkey Kong as another bizarre cartoon game, courtesy of Japan". :5 Donkey Kong was, however, extremely popular in the United States and Canada. The game's initial 2,000 units sold, and more orders were made. Arakawa began manufacturing the electronic components in Redmond because waiting for shipments from Japan was taking too long. :160 By October, Donkey Kong was selling 4,000 units a month, and by late June 1982, Nintendo had sold 60,000 Donkey Kong machines overall and earned $180 million. :211 Judy and Stone, who worked on straight commission, became millionaires. :160 Arakawa used Nintendo's profits to buy 27 acres (11 ha) of land in Redmond in July 1982.:113 Nintendo earned another $100 million on the game in its second year of release,:111 totaling $280 million (equivalent to $772 million in 2019). It remained Nintendo's top seller into summer 1983.:284 Donkey Kong also sold steadily in Japan. :46 Electronic Games speculated in June 1983 that the game's home versions contributed to the arcade version's extended popularity, compared to the four to six months that the average game lasted. In January 1983, the 1982 Arcade Awards gave it the Best Single-player video game award and the Certificate of Merit as runner-up for Coin-Op Game of the Year. Ed Driscoll reviewed the Atari VCS version of Donkey Kong in The Space Gamer No. 59. Edwards commented that "The faults really outweigh the plusses, especially if you've got 'Donkey Kong Fever'. For the addicted, your cure lies elsewhere. Still, if you just play the game occasionally, or never, you may like this cartridge. However, play the store's copy, or try a friend's, before you buy." In September 1982, Arcade Express reviewed the ColecoVision port and scored it 9 out of 10. Creative Computing Video & Arcade Games in 1983 stated that "Coleco did a fabulous job" with Donkey Kong, the best of the console's first five games and "the most faithful adaptation of the original video game I have seen". The magazine's Danny Goodman stated that of Coleco's three console versions, the one for the ColecoVision was the best, "followed surprisingly by the Atari and Intellivision, in that order". Computer and Video Games reviewed the ColecoVision port in its September 1984 issue and scored it 4 out of 4 in all four categories of Action, Graphics, Addiction and Theme. The Famicom version of the game sold 840,000 units in Japan. Main article: Universal City Studios, Inc. v. Nintendo Co., Ltd. In 1996 Next Generation listed the arcade, Atari 7800, and cancelled Coleco Adam versions as number 50 on their "Top 100 Games of All Time", commenting that even ignoring its massive historical significance, Donkey Kong stands as a great game due to its demanding challenges and graphics which manage to elegantly delineate an entire scenario on a single screen. In February 2006, Nintendo Power rated it the 148th best game made on a Nintendo system. Today, Donkey Kong is the fifth most popular arcade game among collectors. Donkey Kong was an inspiration for the 1983 platform game for home computers Jumpman, according to the game's creator. Super Smash Bros. Brawl features music from the game arranged by Hirokazu "Hip" Tanaka and a stage called "75m", an almost exact replica of its Donkey Kong namesake. While the stage contains her items, Pauline is missing from her perch at the top of the stage. Crazy Kong was officially licensed from Nintendo and manufactured by Falcon for some non-US markets. Nevertheless, Crazy Kong machines found their way into some American arcades, often installed in cabinets marked as Congorilla. Nintendo was quick to take legal action against those distributing the game in the US. :119 Bootleg copies of Donkey Kong also appeared in both North America and France under the Crazy Kong, Konkey Kong or Donkey King names. The 1982 Logger arcade game from Century Electronics is a direct clone of Donkey Kong, with a large bird standing in for the ape and rolling logs instead of barrels. Many home computer clones directly borrowed the gorilla theme: Killer Gorilla (BBC Micro, 1983), Killer Kong (ZX Spectrum, 1983), Crazy Kong 64 (Commodore 64, 1983), Kongo Kong (Commodore 64, 1983), Donkey King (TRS-80 Color Computer, 1983), and Kong (TI-99/4A, 1983). One of the first releases from Electronic Arts was Hard Hat Mack (Apple II, 1983), a three-stage game without an ape, but using the construction site setting from Donkey Kong. Other clones recast the game with different characters, such as Cannonball Blitz (Apple II, 1982), with a soldier and cannonballs replacing the ape and barrels, and the American Southwest-themed Canyon Climber (Atari 8-bit, 1982). Epyx's Jumpman (Atari 8-bit, 1983) reuses a prototypical name for the Mario character in Donkey Kong. A magazine ad for the game has the tagline "If you liked Donkey Kong, you'll love JUMPMAN!" Jumpman, along with Miner 2049er (Atari 8-bit 1982) and Mr. Robot and His Robot Factory (Atari 8-bit, 1984), focuses on traversing all of the platforms in the level, or collecting scattered objects, instead of climbing to the top. There were so many games with multiple ladder and platforms stages by 1983 that Electronic Games described Nintendo's own Popeye game as "yet another variation of a theme that's become all too familiar since the success of Donkey Kong". That year Sega released a Donkey Kong clone called Congo Bongo in arcades. Although using isometric perspective, the structure and gameplay are similar. The Atari 8-bit computer port of Donkey Kong contains one of the longest-undiscovered Easter eggs in a video game. Programmer Landon Dyer had his initials appear if the player died under certain conditions, then returned to the title screen. This remained undiscovered for 26 years until Dyer revealed it on his blog, stating "there's an easter egg, but it's totally not worth it, and I don't remember how to bring it up anyway." The steps required to trigger it were later discovered by Don Hodges, who used an emulator and a debugger to trace through game's code. Donkey Kong spawned the sequel Donkey Kong Jr. (1982) with the player controlling Donkey Kong's son in an attempt to save his father from the now-evil Mario. The 1983 spinoff Mario Bros. introduced Mario's brother Luigi in a single-screen cooperative game set in a sewer, and launched the Mario franchise. Also in 1983, Donkey Kong 3 appeared in the form of a fixed shooter, with an exterminator ridding the ape—and insects—from a greenhouse. Nintendo revived the Donkey Kong franchise in the 1990s for a series of platform games and spin-offs developed by Rare, beginning with Donkey Kong Country in 1994. In 2004, Nintendo released Mario vs. Donkey Kong, a sequel to the Game Boy's Donkey Kong, in which Mario must chase Donkey Kong to get back the stolen Mini-Mario toys. In the follow-up Mario vs. Donkey Kong 2: March of the Minis, Donkey Kong once again falls in love with Pauline and kidnaps her, and Mario uses the Mini-Mario toys to help him rescue her. Donkey Kong Racing for the GameCube was in development by Rare, but was canceled when Microsoft purchased the company. In 2004, Nintendo released the first of the Donkey Konga games, a rhythm-based game series that uses a special bongo controller. Donkey Kong Jungle Beat (2005) is a unique platform action game that uses the same bongo controller accessory. In 2007, Donkey Kong Barrel Blast was released for the Nintendo Wii. It was originally developed as a GameCube game and would have used the bongo controller, but it was delayed and released exclusively as a Wii game with no support for the bongo accessory. Donkey Kong appears as a game in the Wii U game NES Remix, which features multiple NES games and sometimes "remixes" them by presenting significantly modified versions of the games as challenges. One such challenge features Link from The Legend of Zelda traveling through the first screen to save Pauline. The difficulty is increased compared to the original Donkey Kong because Link cannot jump, as in Zelda. By late June 1982, Donkey Kong's success had prompted more than 50 parties in the U.S. and Japan to license the game's characters. :215 Mario and his simian nemesis appeared on cereal boxes, board games, pajamas, and manga. In 1983, the animation studio Ruby-Spears produced a Donkey Kong cartoon (as well as Donkey Kong Jr.) for the Saturday Supercade program on CBS. In the show, mystery crime-solving plots in the mode of Scooby-Doo are framed around the premise of Mario and Pauline chasing Donkey Kong (voiced by Soupy Sales), who has escaped from the circus. The show lasted two seasons. Since its original release, Donkey Kong's success has entrenched the game in American popular culture. In 1982, Buckner & Garcia and R. Cade and the Video Victims both recorded songs ("Do the Donkey Kong" and "Donkey Kong", respectively) based on the game. Artists like DJ Jazzy Jeff & the Fresh Prince and Trace Adkins referenced the game in songs. Episodes of television series such as The Simpsons, Futurama, Crank Yankers and The Fairly OddParents have also contained references to the game. Even today, sound effects from the Atari 2600 version often serve as generic video game sounds in films and television series. The phrase "It's on like Donkey Kong" has been used in various works of popular culture. In November 2010, Nintendo applied for a trademark on the phrase with the United States Patent and Trademark Office. The first star player of Donkey Kong was Billy Mitchell, who held the world record for several decades. The 2007 documentary The King of Kong: A Fistful of Quarters tells the story of Steve Wiebe's attempts to break Billy Mitchell's record. 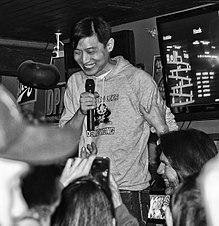 In the early 2010s, Hank Chien set a new record of 1,138,600. This was broken four years later by Robbie Lakeman. The current world record was set by Robbie Lakeman on February 2, 2018, with a score of 1,247,700. In 2018, Mitchell was stripped of his records by Twin Galaxies and banned from submitting new scores after Twin Galaxies concluded that Mitchell had illicitly used emulators to achieve his scores. Twin Galaxies prohibits the use of emulators for high scores they publish because they allow undetectable cheating. ^ Programming assistance by Ikegami Tsushinki. ^ a b c "Coleco Rolls Videogame Line". Arcade Expres. 1 (2): 3. August 30, 1982. Archived from the original on September 26, 2016. ^ "Coleco Mini-arcades G Gold". Arcade Express. 1 (1): 4. August 15, 1982. ^ "ファミコンミニ／ドンキーコング". Nintendo. Archived from the original on May 26, 2015. Retrieved May 24, 2015. ^ Crawford, Chris (2003). Chris Crawford on Game Design. New Riders Publishing. ^ "The Player's Guide to Climbing Games". Electronic Games. 1 (11): 49. January 1983. Archived from the original on March 19, 2016. ^ a b "Gaming's most important evolutions". GamesRadar. October 8, 2010. p. 3. Archived from the original on March 19, 2012. Retrieved April 11, 2011. ^ a b Sellers, John (2001). Arcade Fever: The Fan's Guide to the Golden Age of Video Games. Philadelphia: Running Book Publishers. ^ a b c d e De Maria, Rusel, and Wilson, Johnny L. (2004). High Score! : The Illustrated History of Electronic Games. 2nd ed. New York: McGraw-Hill/Osborne. ^ a b Seth Gordon (director) (2007). The King of Kong: A Fistful of Quarters (DVD). Picturehouse. ^ McLaughlin, Rus (September 14, 2010). "IGN Presents The History of Super Mario Bros". IGN. Archived from the original on April 12, 2014. Retrieved April 9, 2014. ^ a b Ray, Sheri Graner (2004). Gender Inclusive Game Design: Expanding the Market. Hingham, Massachusetts: Charles Rivers Media, Inc.
^ a b c d e f g h i j k l m Kohler, Chris (2005). Power-up: How Japanese Video Games Gave the World an Extra Life. Indianapolis, Indiana: BradyGAMES. ^ a b c d e f g h i j k l m n o p q r s t u Kent, Steven L. (2002). The Ultimate History of Video Games: The Story Behind the Craze that Touched our Lives and Changed the World. New York: Random House International. ISBN 978-0-7615-3643-7. OCLC 59416169. Archived from the original on June 24, 2016. ^ a b Copyright law decisions. Commerce Clearing House. 1985. Retrieved February 26, 2012. An English translation of the Japanese term Donkey Kong is "crazy gorilla." Nintendo Co., Ltd. expended over $100,000.00 in direct development of the game, and Nintendo Co., Ltd. hired Ikegami Tsushinki Co., Ltd. to provide mechanical programming assistance to fix the software created by Nintendo Co., Ltd. in the storage component of the game. The name "Ikegami Co. Lim." appears in the computer program for the Donkey Kong game. Individuals within the research and development department of Nintendo Co., Ltd., however, created the Donkey Kong concept and game. ^ Company:Ikegami Tsushinki Archived January 7, 2011, at the Wayback Machine. Game Developer Research Institute. Retrieved on May 17, 2009. ^ East, Tom (November 25, 2009). "Donkey Kong Was Originally A Popeye Game". Official Nintendo Magazine. Official Nintendo Magazine. Archived from the original on November 10, 2014. Retrieved February 28, 2013. Miyamoto says Nintendo's main monkey might not have existed. ^ a b c d e f g h i j k l m n o p Sheff, David (1999). Game Over: Press Start to Continue: The Maturing of Mario. Wilton, Connecticut: GamePress. ^ Mikkelson, Barbara; Mikkelson, David (February 25, 2001). "Donkey Wrong". Snopes. Retrieved August 29, 2014. ^ "Miyamoto Shrine: Shigeru Miyamoto's Home on The Web:". Interview with Miyamoto (May 16, 2001, E3 Expo). Archived from the original on July 2, 2007. Retrieved May 31, 2007. ^ a b Famicom 20th Anniversary Original Sound Tracks Vol. 1 (Media notes). Scitron Digital Contents Inc. 2004. Archived from the original on December 2, 2010. ^ a b "Donkey Kong". Smash Bros. DOJO!!. Archived from the original on March 12, 2008. Retrieved March 8, 2008. ^ "Harris Shore". IMDb. Archived from the original on February 17, 2017. Retrieved February 1, 2017. ^ Harmetz, Aljean (January 15, 1983). "New Faces, More Profits For Video Games". Times-Union. p. 18. Retrieved February 28, 2012. ^ "More Mini-Arcades A Comin'". Electronic Games. 4 (16): 10. June 1983. Archived from the original on January 22, 2013. Retrieved February 1, 2012. ^ Parish, Jeremy (October 31, 2006). "Wii Virtual Console Lineup Unveiled". 1UP.com. Archived from the original on June 3, 2011. Retrieved November 1, 2006. ^ Kemps, Heidi (November 16, 2010). "Europe gets exclusive 'perfect version' of NES Donkey Kong in its Mario 25th Anniversary Wiis". GamesRadar. Archived from the original on December 23, 2014. ^ Axon, Samuel (October 12, 2010). "Nintendo Announces 25th Anniversary Mario Consoles for Europe". Mashable. Archived from the original on October 27, 2014. Retrieved January 27, 2015. ^ Gantayat, Anoop (July 20, 2012). "Nintendo Kicks off Download Game Sales With Campaign". Andriasang. Archived from the original on December 28, 2014. Retrieved January 27, 2015. ^ "Donkey Kong Free Game Giveaway". Club Nintendo. Nintendo. Archived from the original on October 3, 2012. Retrieved January 27, 2015. ^ Schreier, Jason (October 1, 2012). "Buy One Of Five 3DS Games Online And You Get A Free Copy Of Donkey Kong: Original Edition". Kotaku. Archived from the original on May 1, 2015. Retrieved January 27, 2015. ^ Warmuth, Christopher. "Europe: Original Donkey Kong Edition & Japan: Mario Pinball Land". Mario Party Legacy. Archived from the original on April 16, 2015. Retrieved January 27, 2015. ^ Vuckovic, Daniel (September 18, 2014). "Nintendo Download Updates (19/9) Beats, Rhythm and Warriors". Vooks. Archived from the original on May 1, 2015. Retrieved January 27, 2015. ^ Kohler, Chris (June 14, 2018). "Two Long-Lost Nintendo Arcade Games Are Heading To Switch". Kotaku. Retrieved June 21, 2018. ^ Good, Owen S. (September 13, 2018). "Nintendo Switch Online has these 20 classic NES games". Polygon. Retrieved April 5, 2019. ^ Weiss, Brett Alan. "Donkey Kong – Review". AllGame. Archived from the original on November 14, 2014. Retrieved August 18, 2017. ^ Jörg Ziesak (2009), Wii Innovate – How Nintendo Created a New Market Through Strategic Innovation, GRIN Verlag, p. 2029, ISBN 3-640-49774-0, archived from the original on April 18, 2016, retrieved April 9, 2011, Donkey Kong was Nintendo's first international smash hit and the main reason behind the company's breakthrough in the Northern American market. In the first year of its publication, it earned Nintendo 180 million US dollars, continuing with a return of 100 million dollars in the second year. ^ "CPI Inflation Calculator". Bureau of Labor Statistics. Archived from the original on March 15, 2011. Retrieved March 22, 2011. ^ Pearl, Rick (June 1983). "Closet Classics". Electronic Games. p. 82. Archived from the original on January 7, 2015. Retrieved January 6, 2015. ^ "Electronic Games Magazine". Internet Archive. Archived from the original on January 2, 2013. Retrieved February 1, 2012. ^ a b Edwards, Richard A. (January 1983). "Capsule Reviews". The Space Gamer. Steve Jackson Games (59): 44, 46. ^ Linzmayer, Owen (Spring 1983). "Home Video Games: Colecovision: Alive With Five". Creative Computing Video & Arcade Games. p. 50. ^ "File:CVG UK 035.pdf". Retro CDN. August 31, 2015. Archived from the original on December 22, 2015. Retrieved December 17, 2015. ^ "How did Mario get his name... and the origins of your favourite Nintendo stars – Official Nintendo Magazine". September 24, 2012. Archived from the original on September 24, 2012. Retrieved October 10, 2017. ^ "Top 100 Games of All Time". Next Generation. No. 21. Imagine Media. September 1996. p. 52. ^ Michaud, Pete (February 2006). "NP Top 200". Nintendo Power. 197: 58. ^ McLemore, Greg, et al. (2005). "The Top Coin-operated Videogames of All Time Archived January 27, 2013, at WebCite". Retrieved October 11, 2011. ^ "I talked to Randy Glover about Jumpman". Archived from the original on January 15, 2008. Retrieved June 3, 2007. ^ a b "Smash Bros. DOJO!! – 75m". Smash Bros.Dojo. Archived from the original on March 8, 2008. Retrieved March 8, 2008. ^ "Logger". Killer List of Video Games. Archived from the original on March 28, 2014. ^ Canyon Climber – via YouTube. ^ "Epyx Jumpman ad". Electronic Games Magazine: 81. June 1983. ^ Sharpe, Roger C. (June 1983). "Insert Coin Here". Electronic Games. p. 92. Archived from the original on January 7, 2015. Retrieved January 6, 2015. ^ "Congo Bongo". Arcade History. ^ "Donkey Kong Easter Egg Discovered 26 Years Later". Kotaku.com. Archived from the original on June 3, 2013. Retrieved May 29, 2013. ^ "Donkey Kong and Me". Dadhacker.com. March 4, 2008. Retrieved May 29, 2013. ^ Hodges, Don (July 1, 2009). "Donkey Kong Lays an Easter Egg". Archived from the original on September 6, 2011. ^ Gross, Doug (November 10, 2010). "Nintendo seeks to trademark 'On like Donkey Kong'". CNN. Archived from the original on October 22, 2012. Retrieved November 10, 2010. ^ "The King of Kong: A Fistful of Quarters > Overview". Allmovie. Archived from the original on July 22, 2009. Retrieved May 4, 2009. ^ "Another world record claimed in Donkey Kong". Polygon.com. Retrieved April 13, 2018. ^ a b Crecente, Brian. "'King of Kong' Star Stripped of High Scores, Banned From Competition". Variety. Penske Business Media, LLC. Retrieved November 25, 2018. Wikimedia Commons has media related to Donkey Kong.